We ate GOAT! Although I’d like to feel super brave for doing this… honestly goat did not taste any different than any other meat I’ve ever tried. The Goat came from a vendor called Many Rocks Farm @ the JFX Farmers Market in Baltimore (so did this week’s Purple Basil!). 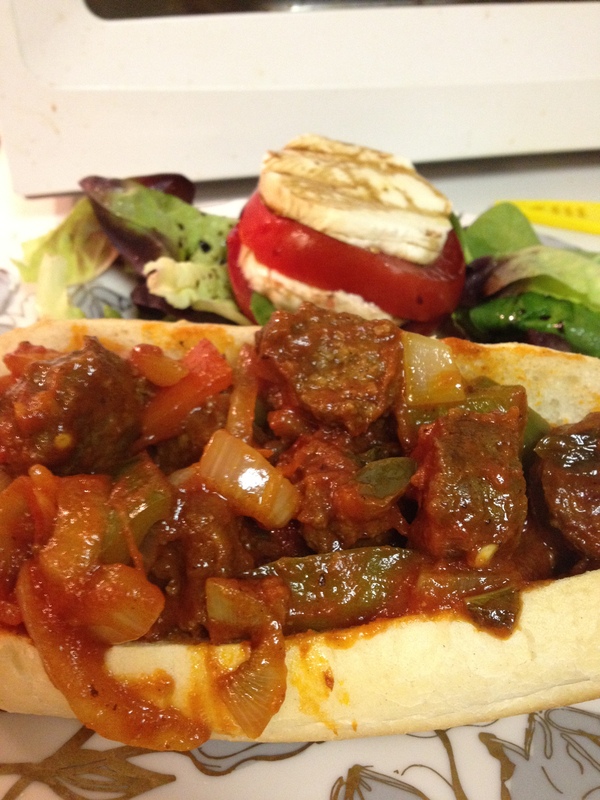 Donny suggested we try it, and the vendor told us that the Goat Chorizo Sausage was a great bet “if we like spicy”… duh. 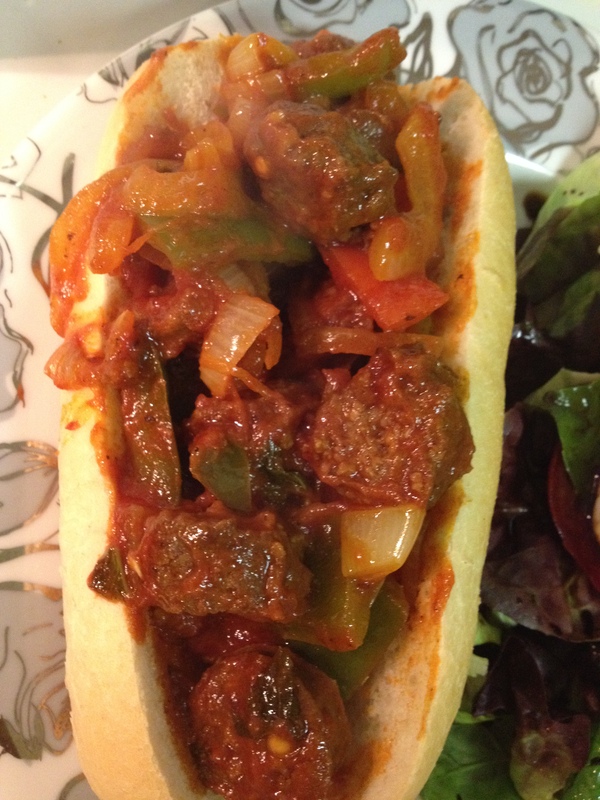 Serves: 4 Sandwiches, with some sausage/peppers leftover! 1. Heat a large pan over medium-high heat. Add the Olive Oil Spray, then the garlic, onions and peppers. Sprinkle with just a touch of salt and pepper. Stir occasionally and let cook for 10-12 minutes. 2. Meanwhile, cut the sausage into small circles. Try to keep the sizes the same so they cook evenly. Once the peppers are starting to soften, add the sausage. Cook for 5 minutes, then stir around or flip them to cook the sausage evenly. 3. Add the Tomato Paste, Sauce, Basil, Italian Seasonings, Red Pepper Flakes, and again- a sprinkle of salt and pepper. Stir around to combine. Cook for another 5-8 minutes. Take out a piece of sausage and cut it to make sure it’s cooked all the way through. 4. Carefully spoon onto dug-out hoagie rolls. Top with desired amount of grated Asiago Cheese. So pretty! Lots and lots of peppers and onions cooking up first. 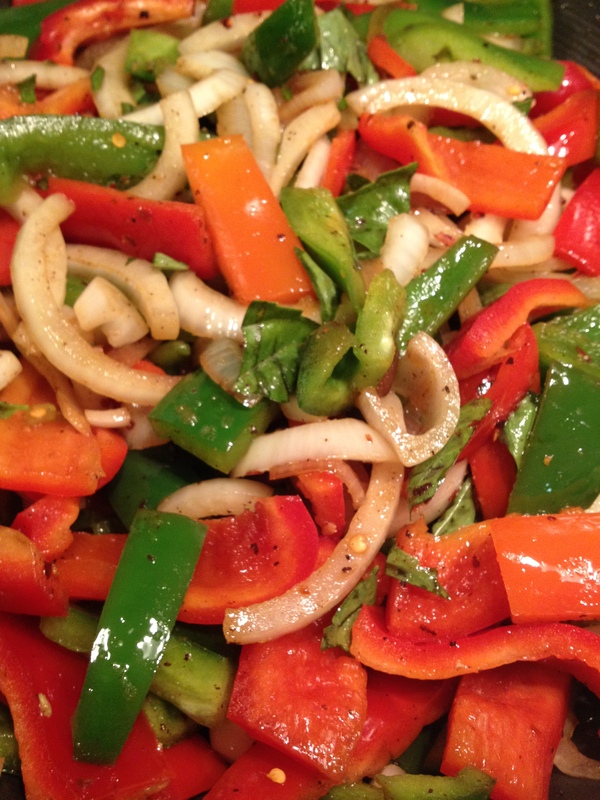 Peppers, Onions, Basil, Seasonings, and Sauce… gettin’ hotter! Dave and I were really surprised how much we liked the goat sausage! 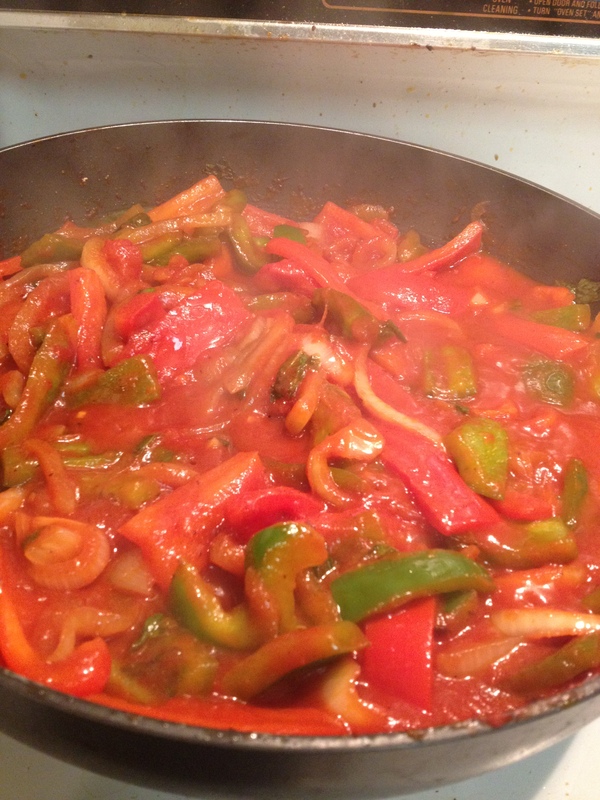 Granted, if you put anything with tomato sauce and peppers, it will probably taste great… but we loved it. The Chorizo had a nice kick too. Believe it or not, goat is actually one of the healthiest meats out there. I wished we lived closer and could get the Goat Sausage again. YUMMY! 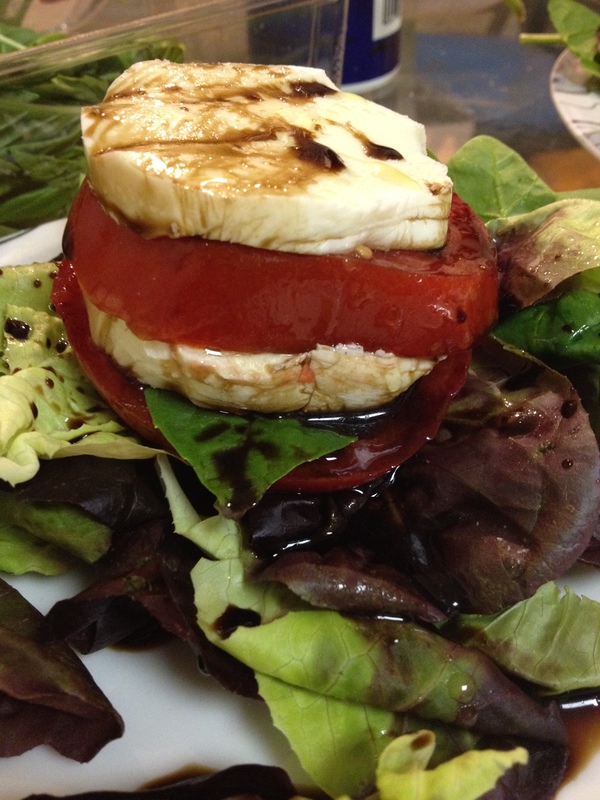 I made a nice fresh TBM stack to go along side using Jersey Tomatoes and some super Fresh Mozz. My new fav. salad.